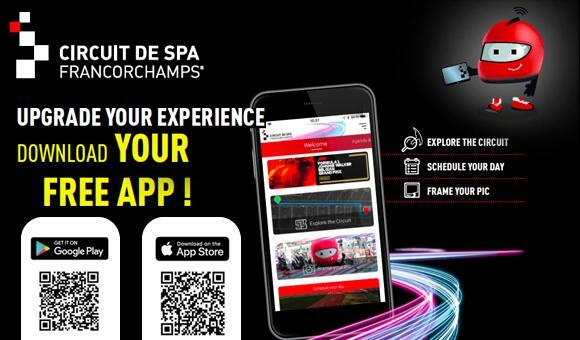 With the launch of its mobile app the Circuit of Spa-Francorchamps is marking a new step in the development of its digitalisation and the services offered to its fans. Available for free on the App Store and Google Play (Spa Francorchamps), this new app will enhance the experience for all fans and visitors to the Circuit. In particular, it will allow people to benefit from geolocation services on the site. To go from one corner to another, from the paddocks to the Fan zone, to find the various dining and catering areas, toilets, paddocks, the entrance to the grid walk and so on, will all become child’s play! You will also be able to add original filters to your selfies or even plan out your day thanks to the fully-detailed timing for the weekends of racing. You will also find the more classic Circuit information on there such as all the latest news or the season calendar, and all this in 4 languages: French, Dutch, German and English. Numerous other functionalities will be added over the course of the season for an even more full-on experience.